When permanent teeth go missing, it’s vital that they get replaced immediately. Why is it so important? There are many problems that could occur when you choose not to replace missing teeth. Those open spaces in your mouth can invite bacteria to throw one heck of a party. Oral disease of any kind is not something you want to put yourself through. At our office in Naples, FL, our dental team has the tools and talent to get you a smile that not only looks beautiful, but is functioning at 100%. Dr. Mark Makram is one of the most skilled general and cosmetic dentists in the area and you’ll soon see why so many patients recommend his practice. Do you really have time for a removable prosthetic? They can be time-consuming and cumbersome for some. 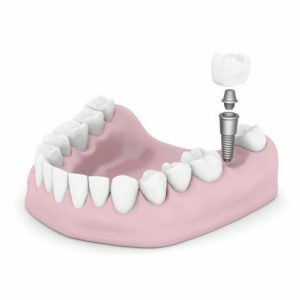 Dental implants are the clear winner when it comes to choosing alternative treatment for missing teeth. Did you know they have a general lifespan of nearly 35 years and have a 90-98% success rate? That’s crazy! A beautiful smile can not only change how you feel about yourself, but can also change how other people look at you. Great first impressions are always good to make when you’re meeting someone for the first time. Having a great looking smile is great if you’re going on a first date or trying to nail that job interview. The best part is, nobody will ever realize you had surgery done on your mouth. That’s how great dental implants are — they give off the look of natural teeth but with much more strength. Dr. Makram has extensive training and experience with dental implants, and he can ensure your procedure goes smoothly. Show off your smile with dental implants and you will never believe how great the results are. If you don’t want to deal with missing teeth and instead want to smile big and bright, our dental team can help you get back your youthful smile. If you’re ready to start living life without missing teeth and enjoy a beautiful smile, dental implants are the way to go. If you’re not from the Naples, FL area, don’t worry! We treat residents from all over the Bonita Springs, Vineyards and Golden Gate area. Get your smile of your youth back and start enjoying life again!